Slow- Release Micellar Casein Formula! 25 Grams Slow-Release Protein! Amino Acid Delivery For Up To 8 Hours! 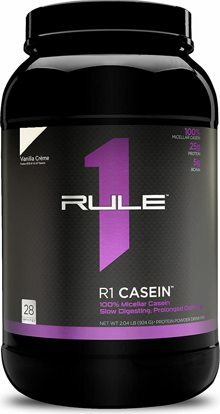 Slow- Release Micellar Casein Formula! 25 Grams Slow-Release Protein! Amino Acid Delivery For Up To 8 Hours!Slow- Release Micellar Casein Formula! 25 Grams Slow-Release Protein! Amino Acid Delivery For Up To 8 Hours! Even in our fast-paced world, there are times when it pays to slow down. Take between meals and bedtime for example. During these occasions you want a protein that takes its time. Something to hold you over until your next meal. A protein that breaks down more slowly, delivering its amino acids over several hours. R1 Casein is what you’re after. Amino acid delivery for up to 8 hours.